Could Trump's border wall have stopped them? Last April we reported on the phenomenon of Mexican-built Ford Fusions being used to smuggle drugs into the US. That time the Fusion couriers were caught in Minnesota, and now it’s happened again. Automotive News reports that the service department of a Ford dealership in Portage County, Ohio, discovered nearly 500 pounds of marijuana worth more than $1 million hidden in the spare tire compartments of 15 Fusions. An additional five pot-stuffed Fusions were soon found at a nearby railway station, and then another nine were discovered at other Ohio and Pennsylvania Ford stores. Each Fusion had about 32 pounds of pot hidden inside, packed tightly in half-moon shapes. What’s funny is that authorities believe the Mexican drug cartel never intended for their product to make it all the way to dealerships; someone clearly didn’t do their job somewhere along the way by unloading the shipment. The vehicles crossed the US-Mexican border in Arizona, and then made their way to Ohio by train. Law enforcement officials don’t believe anyone locally is involved with the smuggling operation, and the dealerships are fully cooperating with the investigation. So, perhaps President Trump was right about Mexico sending drugs to the US; he just forgot to point the finger at the Ford Fusion, too. Photo courtesy of Automotive News. The redesigned sedan is anything but beige. 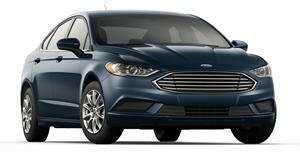 An extensive model range makes the Ford Fusion a good option in the mid-size sedan market.